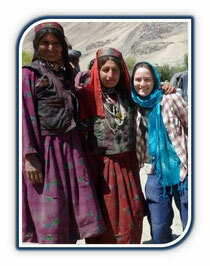 Sarah Sheridan - wakhanexpedition2012s Jimdo-Page! Sarah has over ten years of experience in working as a doctor with a specialisation in international public health and epidemiology. Her extensive travels through Asian continent were influenced both by a quest for discovery as well as a desire to bring her professional skills to those that need them the most. She has travelled overland from South-East Asia to Europe stopping for a chai such countries as Laos, India, Nepal, China, Tajikistan and many more. During the summer 2011, together with Malgosia Skowronska, she has traversed the length of Wakhan Corridor, over 250 km in total, which allowed her to acknowledge possible health problems that may affect the team during the expedition. Apart from bushwalking in Australia, Sarah likes to relax while climbing in New Zealand where she has summitted 3000m Mt Aspiring. Sarah devotion to Central Asian tea pots and ‘addiction’ to find the most beautiful one make her holiday choices very simple and at the same her purse almost empty after paying for overloaded luggage full of crockery.